There are several reasons to choose Prague for your event. Composed of detailed architecture, ancient churches, delectable cuisine and jaw-dropping views, Prague is a city that captures the love of any tourist that visits. 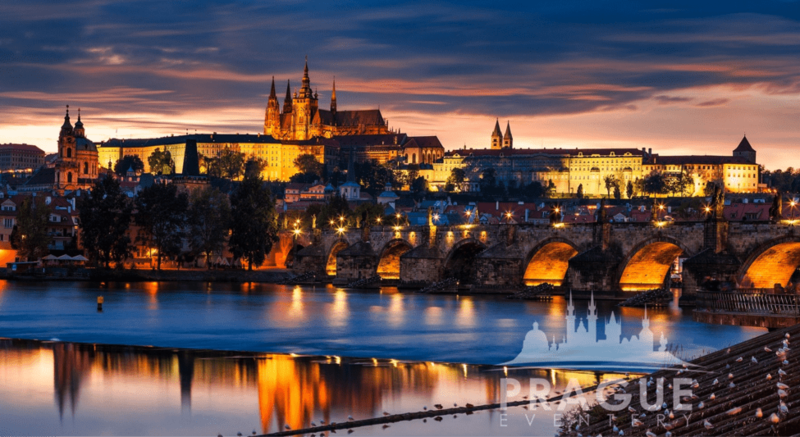 From the historic heart of Old Town Square to the gorgeous city overlook from Prague Castle, the quaint, almost magical beauty of this charming metropolis makes you feel as if you are completely immersed in a fairy-tale. Prague is often regarded as one of the most popular travel destinations in Europe. Whether you’re interested in admiring the religious history and culture of the Czech Republic, or getting a taste of beer from the beer capital of the world, Prague has plenty to show off for anyone that visits and provides several reasons why to choose Prague for your event. With so many unique buildings and intricately crafted sculptures, it is difficult to find a bad angle of this major European city. Prague has aspects of Romanesque, Gothic, Renaissance, Baroque, neoclassical and art nouveau architecture. Having avoided countless wars for centuries, Prague’s architecture spans over a thousand years. The city’s most popular attraction Prague Castle, the largest ancient castle in the world, is a medieval castle built in Gothic style. Within the palace walls is the grand St. Vitus Cathedral constructed with a baroque silver tomb of St. John of Nepomuck, a 14thcentury mosaic of the Last Judgement, the lavish Chapel of St. Wenceslas, as well as the towering art nouveau stained glass windows. If you’re interested in more modern architecture, the deconstructivist or “new-baroque” style of the famous Dancing House adds to Prague’s diverse style. Let Prague Eventery take you on a tourof any of these locations when you come visit. Prague’s preservation over the past several centuries provides a beautiful showcase of some of the biggest events in both Czech and European history. In addition to the renowned Prague Castle and St. Vitus Cathedral, there are a myriad of other locations in the city that dive into the depths of Czech history. The Church of Our Lady Before Tyn, a profound landmark that towers over Old Town, contains the twelve stations of the cross dating back to the fifteenth century. The Church of St. Nicholas in Mala Strana served as Prague’s watch tower until the end of the nineteenth century. During the Communist regime, secret police used this tower to keep careful watch over Prague citizens. The Astronomical Clockin Old Town Square has been in Prague since 1410. In addition to telling time, the clock marks the phases of the moon, equinoxes, seasons and days all while the twelve zodiac signs make their course through the heavens. You can also admire Czech history on the Charles Bridge, built in 1357. The bridge contains Baroque statues that were placed during the 17thcentury and has stood strong through many floods for hundreds of years. Be sure to take a second to stop and listen to Charles Bridge Bandplay as you stroll down this incredible piece of history. Cluttered with red rooftops and cobblestone streets, Prague is a photographer’s dream. If you wish to admire an overview of the city, Letna Parkis one of the best places to see the most historical center of Prague. With a quaint beer garden and rolling grassy fields, Letna Park is a relaxing place to look out over the incredible view of the Vltava River and the Charles Bridge. Consisting of flourishing gardens and blossoming trees, Petrin Hillalso provides a gorgeous panoramic view of Prague and is a great place to enjoy the sunset. Climb the 60-meter observation tower, emulating Paris’s Eiffel Tower, to get an even better look of the city from nearly 400 meters above sea level. Whether it’s via historical trams or a horse drawn carriage, Prague Eventery can help you get to any of these places in luxury and comfort whatever your preferred method of transportationmay be. Prague is famous for its hearty cuisine. To get the most authentic Czech experience during your stay, trying the delicious Czech goulash is a must. This dish is prepared with generous portions of meat, typically beef, chicken or pork, and is then topped with rich, flavorful gravy and served with bread dumplings. For dessert, try the traditional Bohemian trdelnik rolled pastry, commonly referred to as a chimney cake. It’s made by wrapping dough around a metal stick and then roasted over an open flame and dusted with sugar, cinnamon, and nuts. You can even get them filled with ice cream and berries. Every year new, chic, trendy and tasty restaurantspop up all over the city. From fine dining to casual eating, we can connect you with some of the best Czech cuisine in Prague. The Czech Republic has the highest beer consumption per capita in the world. In the past decade, the production of craft beersin Prague has sky rocketed. However, tourists from all over flock to Prague every year to get a taste of even the most traditional Czech brews. Some hometown favorites include Staropramen, Gambrinus, Krusovice and perhaps the most well- known Pilsner Urquellbeer. Just an hour outside of Prague is the birthplace of pilsner. Visit the Pilsner Urquell factory and learn about the history and production of the 175-year-old beer. Let our company organizethe transportation and the tour and enjoy tasting the raw, unfiltered brew where it originated. Prague’s peaceful Vltava Riveradds an inspirational element of beauty to the historic city. Gently winding through 31 kilometers of Prague, the Vltava is one of the most desirable ways to see some of the best angles of the medieval city. From boat cruises to bike paths, there are dozens of ways to admire this tranquil river. Walk down to the river bank and watch the graceful swans and ducks majestically swim by. In some areas you may even be lucky enough to spot a friendly river otter popping out of the water. We can connect you with some of the best river cruisesfor adoring the glorious sights of Prague. Read about the seven best Vltava River cruises on our blog here. Being a city full of history, there are dozens of monuments commemorating pivotal points in the Czech Republic’s development as a country within Prague. Of course Prague Castle, the Charles Bridge and Old Town Square are some of the most iconic aspects of the city, but there are plenty of other memorable monuments to see in the city. The John Lennon Wall, a large graffiti wall in Prague 1, commemorates the former Beatle musician and peace advocate John Lennon. Wenceslas Squareis another notable point of interest. Named after the patron saint of Bohemia, this impressive square was established in the 14thcentury and is still used for various demonstrations and celebrations, while providing a great shopping and dining area. Take a tourof any of these extraordinary monuments with Prague Eventery.